So, I've seen comments left on the blog about how being a registered non stock corp and being a non profit are two different things. Seeing as I don't live in the US, and that I don't have much (any) knowledge about how non profits are formed, I was in some pretty unknown territory. I turned to google, without much in regards to results or clear answers. Initially, I asked for her to explain to me the difference between a non stock and non profit like I was a 5 year old. This was the conversation we had, copy and pasted from facebook chat. MonkeyMama: okay, gotcha. But how does mommys muffin sales relate to a non profit? MonkeyMama: So JUST because someone has a registered NON STOCK corp does not equal them to being a NON PROFIT/NOT FOR PROFIT, Correct? MonkeyMama: right because it wouldn't be helping the kiddies. it would be helping the neighbours, if there were shares. MonkeyMama: Right, but it doesn't make them one and of the same. Jillsmo: RIGHT! Mommy needs to have a "Mission statement," which is "we want to give money to orphans, and we do this by selling muffins." as opposed to "we sell muffins and if we have any left over, orphans can have some, I guess"
MonkeyMama: Okay, so what exactly does having a NON STOCK certificate from a STATE mean? just that it's a "business" that doesn't share it's profits? MonkeyMama: okay, SO NOW i get it. lmfao. thank you for the muffin talk now i do too! So, there ya have it folks, for those of you who didn't understand the difference between a non stock corporation vs non profit. 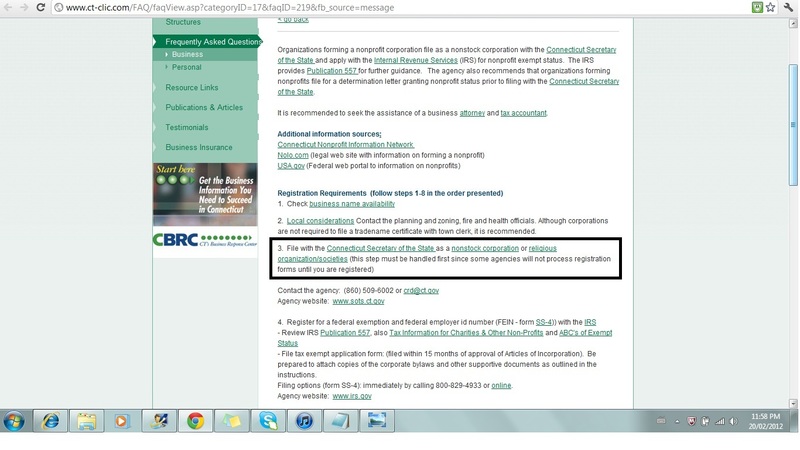 Basically, registering a non stock corporation is only a step in the process of filing to become a non profit. Which is why the terms have somehow become interchangeable. 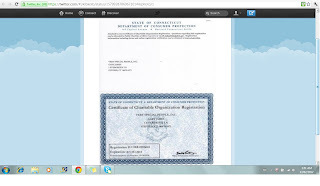 Filing as a non stock corporation in the State of Connecticut gives him this pretty little certificate, which gives him the ability to file with the IRS. The IRS designates the non profit status. 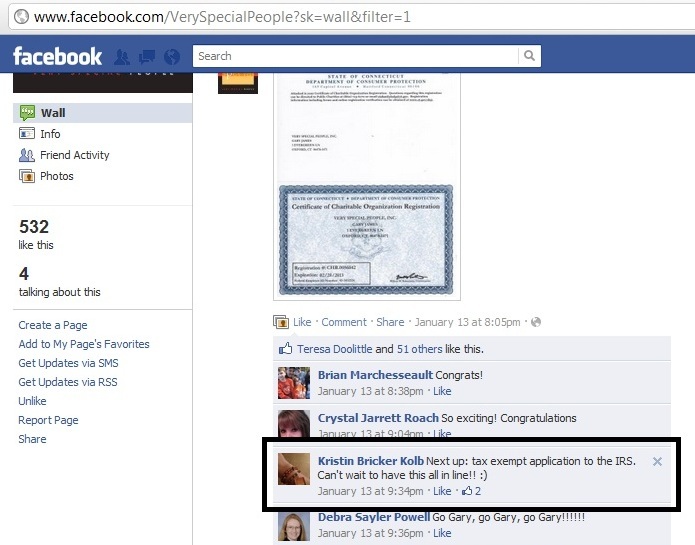 Really, it's just a certificate that makes him look more important than he actually is. A sycophant will think that's cool. It still doesn't make their donation tax deductible. 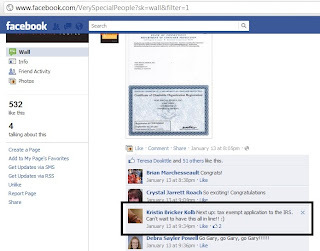 The above certificate allows him to file with IRS. As far as I can tell ( I do have people in the know), filing with the IRS has not yet happened. However "it's in the works!" Again, just because it's in the works, doesn't make your donation tax deductible either! So, that's what VSP is. 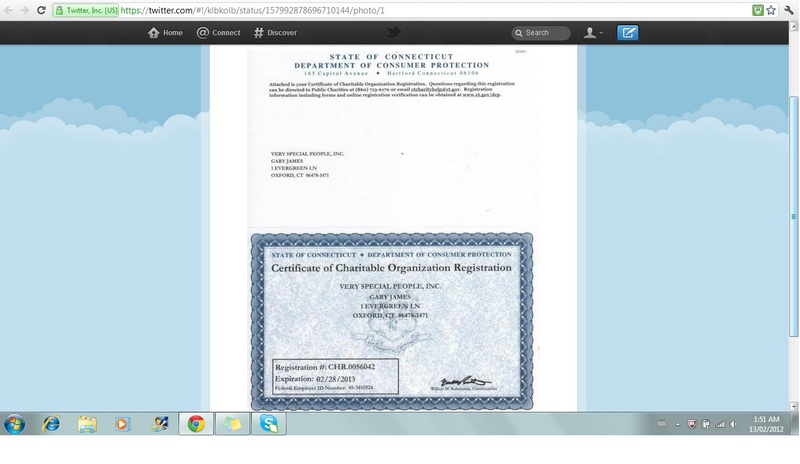 A non stock corporation, in the state of Connecticut. It cannot give tax deductions on donations. It is at this point, not a non profit. EDIT: To be clear, this doesn't have anything to do with what A4CWSN is. 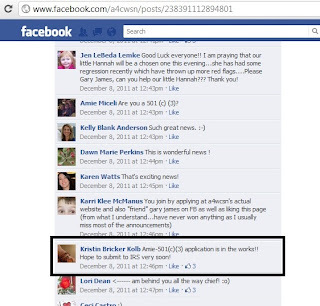 A4CWSN is nothing more than "a man and a computer" who is running an illegal charity through a facebook page. More smoke and mirrors from A4cwsn/VSP to confuse SN parents into donating to what they believe is a legitimate charity. I hope people do their homework before lining this "man and his computer"s pocket! Thank you for writing this blog monkeymama to keep us informed! not a lawyer but good at talking about muffins and making it easier for us to understand. Thanks! Thanks for un muddying the waters. Seems it is Mr. James MO to keep the masses confused and the waters black with innuendos and misinformation. Heh, funny...how about this gem from a week ago? Also, to clarify - nonprofits are ALL tax exempt. What he states on Facebook is an oxymoron. Just because you don't have any money doesn't make you a nonprofit organization. This is the best blog you have written to date. The difference between non stock and non-profit seems to be the reason why so many people "hang on" to the lies. Thank you so much for writing. 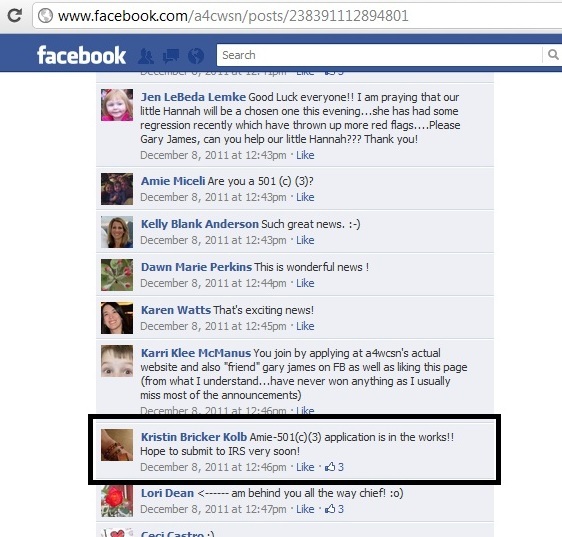 Right, VSP is not a non profit. It's a non stock corporation. And it's clear it's not a non profit because the IRS gives that designation. Not the state. I find it funny that he says "...as you know, ". Excuse me? What I KNOW is that you are a cheat and a liar.